It has taken me years to figure out exactly what a central bank is. And it hasn't been easy to understand. As a matter of fact, it tooks years just to figure out that I that I didn't understand the entire concept of the Feds, and how this establishment was actually detrimental to the people it claims to 'serve'. Probably the best examination of central banking I have seen lately was presented in the movie Zeitgeist - the Addendum. I highly recommend viewing at least the first half of this movie for those who wish a crystal clear idea of what the Feds (and other central banks) do in plain no-nonsense language. The dangers of the concept of the Feds are expressed very well in the article below - exactly how do the people lose? Truth in our time has become so muddied, the first thing we need in any search for fundamental, unambiguous truth is a good working definition. Something to clutch as a certain cruciform against vampires…a touchstone to help us better navigate lies. Hhmmm….so precisely what is “true”? That Möbius strip leads nowhere. Could a better understanding of truth as an aide to our search for it be found by examining the opposite of truth—by examining untruth? American life floods us with one particular very tried and true untruth: Everything our federal government tells us, either officially, or through mainstream corporate media. So, a reliable working definition of truth here could be: “Exactly what government does not tell”. Certainly they tell occasional superficial truths, but those always have tendrils merging into the massive and nearby body of deceit. Let’s test drive the definition—not conventionally as one would with perhaps a list of lies, specific lies, that’d set us on another Möbius strip since ultimately it’s all the same, or has only one side, lies. No, let’s take a spin through authority, some entrenched establishment symbolism. What might evoke more bedrock images of federal government than the Federal Reserve (Fed), our central bank (which is not actually a bank, and has no reserves)? Simmering in its deep heritage of untruth…the Fed is in no way a part of the federal government, but is instead a private corporation. The Fed’s ultimate agenda orbits profit for a mostly foreign banking cartel. It is a private money making machine disguised as a part of “Government of the People, by the People and for the People”, creating “money” by simple data entry, then bleeding the people by loaning it to the government at interest. How in the name of government, in disgusting violation of the Constitution, did this happen? Rep. Ron Paul tells us. 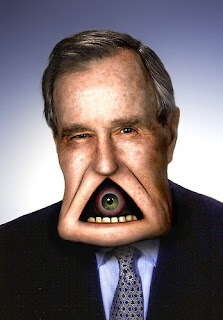 He introduced the Federal Reserve Board Abolition Act (HR 2755), in June 2007. Considering the Fed’s seamless legacy of untruth…one might suspect that they actually are doing it again—note how much of the current “bailout” money is being used for acquisition…banks swallowing other banks, trillions in debt passed to future taxpayers. Try explaining something like this to your child. Shaking the Bushes is an unlikely way to flush out truth, but it seems a blue moon can make both Georges spontaneously stray into actual truth.. Is it a ploy to further confuse us, or merely a wrinkle in perception management? Talk about hitting pay dirt! In that simple nonchalance of George I, the fundamental truth underlying the foundational untruth of not only the Fed, but the federal government, corporate mainstream media—and owners of all of the above—the financial elite, is revealed. Yes, the government is owned by our nemesis, the financial elite. They own our free press, they own you…they own the world. The common good is as irrelevant to our owners as the future of humanity, and what they want is all they’ve ever wanted: more. Will we simply keep swallowing their effluent until the Republic is dead? All we really need to know, something we’ve had our noses rubbed in a very long time, is that the government deals exclusively in untruth. If it ever mattered even a little, truth has been absolutely and permanently supplanted by perception management, which, when it comes to the people, is the government’s only genuine concern (in Bush jargon, one American = OFU, or “one fodder unit”). The people have been so incredibly dumbed-down chemically and socially and every possible way in between that in the breadlines and soup kitchens, major-league baseball will probably be the hottest topic…or the Superbowl, or Brittney and Brad and Jen or the latest Superhero movie…. Evolution has given women special insight to survive in a world where men dominate physically, do most of the slaughtering, and blaze where humanity would be better off not going. So what has a majority of the slaughter throughout history been motivated by? “…the continuous consolidation of money and power into higher, tighter and righter hands.” If George I spoke only two truths in his whole wretched infliction upon us, that one rules. “…the continuous consolidation of money and power into higher, tighter and righter hands” drove the fraudulent presidential installation of George II, twice. Same thing for 9/11…for the absolutely mind-defying War on Terror! Oil wars, shock-and-awe, wanton slaughter of millions. War on the Biosphere, Great Depression redux, American concentration camps for Americans, American troops deployed against Americans on American streets, false flag terror, martial law. Suspension of the Constitution, death of the Republic…. Inhumanity American “leadership” has inflicted on the rest of the world for over half a century is now coming home. That’s the foundational truth everything can be distilled down to, the bottom-line truth we’ve been looking for—and what an unlikely place to find it…what eerie irony. From the forked tongue of George I.
It’s the driving force behind everything in Planning Central, the only thing that matters. And with the face of the beast exposed…if we still have time, will we ever muster the will—and especially find the leadership—to turn back toward the humane? For the opposing point of view click here. There are so many things about the way modern civilization came into being that shock me. In retrospect, much of what I learned in school was ridiculous misinformation. The "Food Triangle" (or whatever it's called) now just a big fat lie since I've become vegan. And when I found out that the central bank creates money out of nothingness as it sees fit... I was like Kevin in "The Office": "Are you kidding me? You've got to be kidding me." Sometimes I wish that there were friendly creatures from other, better planets, who would come rescue me. I'd even go with robots. Yes we have been duped alright. I wish there was a benign alien force to rescue us but I am afraid we are on our own now. The best we can do now is build and encourage the awakening of people still groggy from the sleep of consumerism - and encourage them to unite to take control of their own destiny. No one is coming to save us...we must be our own heroes now I think and build networks across borders while we still have freedom on the net. Nix on the robots tho - guess who programs them? Thanks for you comment and keep on keeping on...there is no other choice.